It was described as "the Mona Lisa" of Vienna and for years was the main attraction of Austria's Vienna Belvedere Gallery: Gustav Klimt's 1907 portrait of Adele Bloch-Bauer I, known as The Lady in Gold, is one of the most famous paintings in the world. The story of how it came to be moved from Austria, to hang in the Neue Galerie in New York, is now the story of a film, Woman in Gold, starring Dame Helen Mirren. "It was theft by the Nazis," says Dame Helen. "That painting belonged to the family of an Austrian Jew called Maria Altmann, of which she was the surviving member after the Holocaust. Adele Bloch-Bauer was her aunt. "The Nazis looted the painting and after the war it took pride of place in the Belvedere. Maria mistakenly believed for years it had been donated to them, and it was only at the age of 82 after discovering the truth, that she launched a lawsuit to get it back." 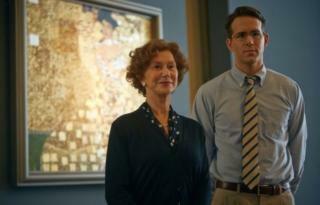 Made by BBC Films and directed by Simon Curtis, who made My Week With Marilyn, Woman in Gold sees Dame Helen [clearly playing Maria a lot younger than she was] starring opposite Ryan Reynolds, who plays the young lawyer who took on Altmann's case. The Austrian government refused to settle with Altmann because, the actress says, "the problem was that they were iconic pictures. At the time of painting by Klimt, they were thought of as being decadent, and even though they were looted, the Nazis didn't particularly approve of them". "But after the war they ended up in the Belvedere, the British equivalent of the National Gallery, and when you went to Vienna, if you bought a souvenir mug or fridge magnet, it would probably have The Lady in Gold on it. Then there's this little old woman saying: 'I'm sorry, that's mine'. The shock was huge. "Maria Altmann was a really remarkable woman, and I wish I had managed to meet her before she died," says the actress. "It's a story of justice against the odds, that's why I wanted to do it, there's courtroom drama in there too, and also the relationship of an older woman and a younger man, which you don't often get. It was rich pickings for an actress." Media captionDame Helen Mirren: "It's not just stolen art. It's a symbol of stolen life"
True stories of art theft - whether 2014's Big Eyes, starring Amy Adams and Christoph Waltz, or The Monuments Men, directed by George Clooney - have become popular with film-makers in recent years. Dame Helen says such films, if seen by enough people, can change government policy, even though Altmann had to defeat the Austrian government in a court of law in 2006 in order to have the painting returned to her. "We show in this film the art becomes a symbol of a stolen life and stolen memories," she says. "I believe the necklace belonging to Adele in the original portrait actually went to Hermann Goering's wife and ended up round her neck at Nazi parties. That generation of Austrian Jews, in many cases, lost their whole families. It's totally incomprehensible and for Maria, it was much more than getting a painting back. "When we filmed in Vienna, the government and the new mayor were wonderful to us and said they had great respect for Maria Altmann because she made them look again at their history, even though they were not comfortable with doing it, and admit their mistakes." After the Nazi annexation of Austria in 1938, looting and destruction of Jewish homes and businesses followed. Around 94 synagogues were destroyed - and much of the persecution is shown in the film. Altmann and her husband were one of the few lucky Jewish families who escaped Austria - first to Liverpool, and then to Los Angeles, where Altmann set up a cashmere shop. Dame Helen, whose own Russian ancestors had to find refuge in Britain, calls the film "very relevant, very contemporary. There's never a year when it won't be relevant because it's always happening to one community in the world, whoever they happen to be. It's in our nature as humans to demonise 'the other'. "It's always important to remind ourselves of the reality of what happened in Europe because we are losing the generation who witnessed it and who could articulate what happened at first hand. "There's a line in the film which says: 'It's all about the Holocaust to you people'. Well actually yes, it is all about the Holocaust if you experienced it. It happened, and don't try and sweep it under the carpet. "Maria Altmann was always grateful to the British for allowing her refuge in Britain on her way to California. It's even more difficult for refugees to find safe havens in the contemporary world, but then you read about ships of Jewish people being turned away by Britain and the USA during the war. "It's a constant human dilemma of how to react to someone else's trouble, and of the ignorance of not understanding." Altmann died in 2011, aged 94, having been awarded £11m in compensation for the theft, as well as selling The Lady in Gold to the Neue Galerie in New York for £73m - on the condition it was always on display. Dame Helen says: "She gave most of her fortune away. It really never was about how much the painting was worth, it was about getting her aunt back, and about justice." Woman in Gold is out in the UK on 10 April.